Still a common sight in New England, Colonial homes traditionally feature slate- or wood-clad pitched roofs. To lend your home a classic appearance, GAF’s Camelot® and Camelot® II are a smart choice. They emulate the authentic look of slate tiles and wood shakes at a fraction of the cost. The Slateline® also boasts bold shadow lines and tapered cutouts, which are vintage elements of slate roofing. We recommend that you choose bold neutrals for colors. Grays, blacks, and dark hues work well for Colonial homes. Simplicity reigns in Ranch-style homes. They often have long, low rooflines and slopes. For decades, wood shakes have been the popular match for the Ranch. 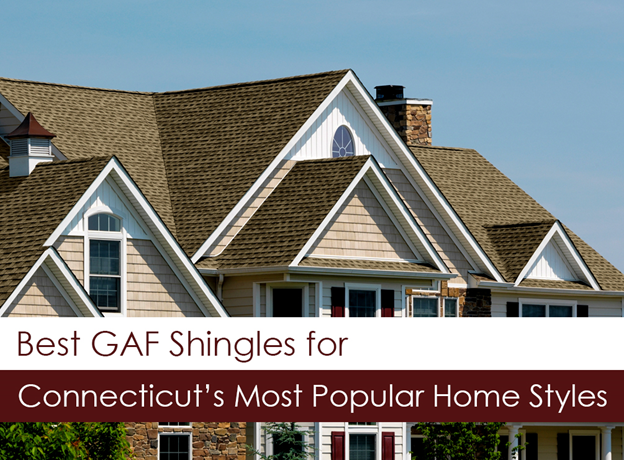 To complement its low-key appeal, GAF Master Elite™ roofers in Stamford, CT, like us generally recommend Timberline® for its modest beauty. To add more character to your roof, you can also choose the Grand Sequoia®. If you desire a rugged wood-shake impression, the Grand Canyon® is the ultimate choice. Hues with brown, gray, or black undertones are the perfect shingle color for Ranch homes. Slateline from GAF is a brilliant choice for modern homes. It introduces subtle sophistication to your home’s low-pitched or flat roof. To lay emphasis on its contemporary vibe, shades with dark grays or browns are ideal choices. These tips help keep your home historically accurate on your next remodeling project. You can always experiment with colors and styles to make your roofing in Stamford, CT, unique. During planning, our skilled designer can offer sound advice to help you choose the apt GAF shingle for your home. Let Vinylume help you choose the right roofing for your design needs. Call us now at (866) 244-8029 to schedule your free in-home consultation at your convenience.